After reading 65+ entries to the Get Gutsy Essay Contest, for the past four days, I’ve shared the winning entries. Be sure to click over to this post to read the gutsy stories from 66 inspiring participants. Today, I’d like to share a *bonus* entry. My best friend and little sister Jamie Lawlor entered the contest this year and while it obviously wouldn’t be fair for me to declare her a winner since we’re family, I still wanted the chance to share her story with you. It’s a beautifully-written story about how sometimes you don’t choose to get gutsy- you’re forced to get gutsy. Read on. As a proud little sister of the genius mind behind the Get Gutsy lifestyle, I’m amazed at how its following has grown and I always look for ways to get gutsy myself. Jess has passed many things on to me from hand-me-downs to life lessons; so it only seems fitting that I embrace the mindset and look for ways to step outside of my comfort zone. A few instances immediately come to mind like the time Jess and I went zip lining in St. Thomas or when I took trapeze lessons as my birthday gift from her. It’s been exhilarating and I now find myself frequently looking for new adventures. While these experiences certainly take a level of courage, a different personal story comes to mind when I think about what it means to get gutsy. Sometimes we choose to step outside our comfort zones, and sometimes life throws something our way that forces us to get gutsy. My recent experience taught me a different side of getting gutsy than the one I was familiar with; it taught me that getting gutsy can mean laughing through fear, smiling through uncertainty and gritting your teeth through pain. 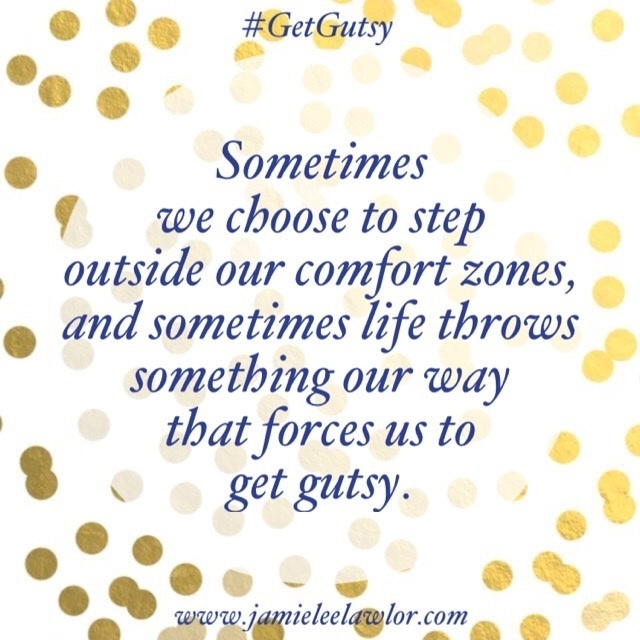 To me, getting gutsy means embracing any new or challenging experience – whether you like it or not – and coming out on the other end with a new, better and more positive outlook on life. At the beginning of November, I received a diagnosis that terrified me: Melanoma. I’d had a mole removed on my upper back near my left shoulder. About a week later, when I saw an incoming call from my dermatologist, my whole body filled with dread. A friend had pointed out this suspicious mole to me on our Memorial Day Weekend beach trip – it was darker than the others and just didn’t look totally normal. A combination of fear and laziness left me putting off making an appointment but my gut told me something was off (another gutsy lesson: always trust your gut!). When I finally met with my dermatologist, he agreed it should be removed and sent to the lab. The report showed a superficial spreading melanoma (meaning it was, fortunately, pretty shallow – contained to the top layers of skin). He referred me to a surgical oncologist to determine next steps. I know there could have been a million worse diagnoses, and melanoma is generally a very treatable condition when caught early. However, as a person with no previous serious health issues, the uncertainty of what this all meant hit hard. Could this be more serious than just one cancerous mole? What if it’s spread elsewhere? Does this mean I’m at risk for the rest of my life? All these questions and more came rushing through my head. The rest moved quickly. My surgical oncologist cleared up much of the uncertainty and fear I felt, explaining every intricacy of my melanoma and the steps we would take. My situation was a pretty common presentation of melanoma, but the way the cells were dividing led to the possibility that it could have spread to the lymph nodes – and therefore, elsewhere in the body. We scheduled me for surgery to do a wide local excision at the site of the melanoma and a sentinel lymph node biopsy which would remove the first lymph node to which cancer cells are most likely to spread in order to be biopsied. The day of surgery was scary and I can’t say I didn’t get a little emotional when the reality of the situation hit as I finally walked back to the pre-op room, when they inserted the IV, when I waved goodbye to my mom to walk myself into the operating room. But an hour or two (and a very nice, deep sleep) later, the easiest part was over and the worst would begin: waiting for the results. Fortunately the phone call came just 3 days later – and even more fortunately it was the best possible news: the local excision removed all melanoma cells and the biopsy of my lymph node came back totally clean and cancer-free. It was overwhelming. I felt grateful, relieved, thrilled, exhausted – overcome with a slew of emotions. And while this conclusion could have led me to reflect on how terrible this situation was and how awful the outcome could have been, I truly found myself focusing on how much I’d learned, how much I’d grown through this experience, how lucky I am that the outcome was this. When I think back on this health journey that I went on, I don’t necessarily recall the pain I felt from needles, the fear I felt hearing my doctors talk to me about my diagnosis or the dread I felt thinking about what this diagnosis could eventually lead to. I think about the support I had from my doctors and friends, the love I had from my family and the confidence that those in my life instilled in me to be brave and have faith. I’ve found myself focusing on the positives of this experience: that I can now feel the importance of being more responsible and careful when it comes to my health, that I’ll now have the frequent monitoring and support from my doctors, that any future situation like this will be caught early, and so much more. I feel like a stronger person and I feel lucky that I have a fresh perspective on the fortune of being healthy – something that we often take advantage of. Sometimes we’re getting gutsy and we don’t even realize it. We embrace new situations, we learn from new experiences, we find the silver lining. And through it all, we become a little stronger. When an exciting opportunity like skydiving presents itself, grab life by the horns and Get Gutsy! But don’t forget to also apply “Get Gutsy” to the little surprises in life; it’s an attitude that can make any situation a positive one. 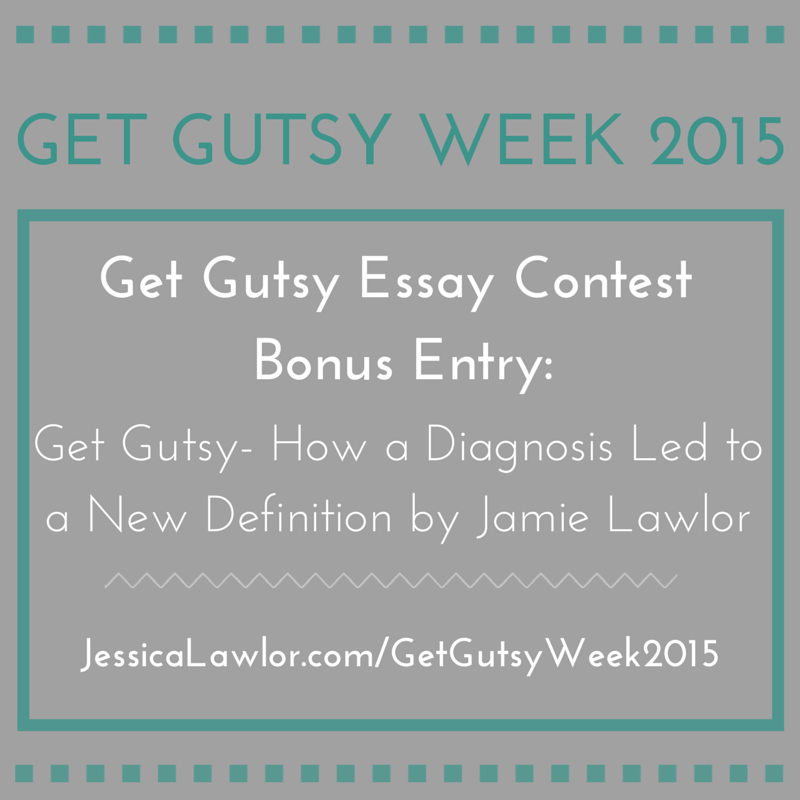 This post was written by Jamie Lawlor as part of the Get Gutsy Essay Contest. Be sure to click over to Jamie’s blog to read the original post and stick around for more great content.